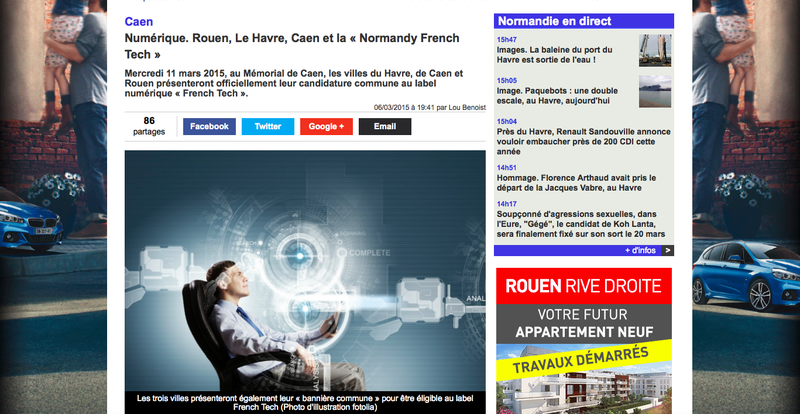 On Wednesday, March 11th, 2015 at the Mémorial de Caen, the cities of Le Havre, Caen and Rouen made their official presentation to add the "digital label" French Tech to their region. It was back in November 2014 that they dropped off their case, and four months later they are getting their chance at the D(igital)-day meeting to officially claim their space in the digital realm. It wasn't just a day of presenting their case, however, they presented the elements of their Normandy candidacy, unveiled their common banner and presented their first Normandy French Tech (Nft) meeting, dedicated to startups and entrepreneurs in Normandy. The first Prime Minister Manuel Valls was in Normandy a month earlier (Feb 13) to underline the importance of the reunification of Normandy, alluding, as well, to the successful collaboration of the cities involved.